Want to Host a Convention? Calendar Call – The UPHS is seeking photos for use in our annual calendar. The calendar is a high-quality product not for sale. Instead, it is distributed to all Sustaining and Preservation level members of UPHS before the end of the year. Here is your chance to help out the Society in one of its yearly projects. Already a member? Are you receiving our e-mail newsletters and announcements? 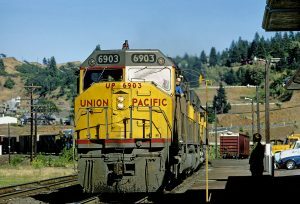 Founded in 1984, the Union Pacific Historical Society (UPHS) is an independent non-profit organization dedicated to the preservation of the history of the Union Pacific Railroad from its beginning in 1862 to the operation as it is today. The society is not supported by, or affiliated with the railroad other than the preservation of its rich and colorful history. Those of you searching for UPRR employment records or genealogy information please go the Genealogy tab under the Resources section of this website. Copyright © 2019 Union Pacific Historical Society. Website by Silver Rockets.